With this much visibility, it was only a matter of time before someone got creative and put their own spin on it. Cue Erica Buddington. The Brooklyn author and arts educator posted a clip to Twitter Thursday that showed her rapping "Bodak Yellow" to her 6th grade Capital Prep Harlem class. (The school was opened by Diddy and renowned educator [and noted enemy of teachers unions] Dr. Steve Perry just last year.) Of course, it came with a twist: she made it all about geography. She got a stamp of approval from the Money Mover herself. Today during dismissal, the entire school was singing this version. As folks keep saying, "Meet them where they are." I reached out to Erica on Twitter, and she told me this isn&apos;t the first time she&apos;s flipped a song for education purposes. "We&apos;ve used the &apos;Panda&apos; beat for figurative language," she said via DM. "And we have poems and little verses for little things. &apos;Panda&apos; was more so them. This was mostly me. We have another for history, modifying &apos;Mask Off&apos; so they can learn their presidents. Last year, to learn rocks, a science teacher did &apos;We Will Rock You.&apos; They love it!" Erica emphasized that these remixes don&apos;t always come from just her. "[My students] say little phrases in class and I put most of the rest of it together," she said. "I helped them write it, but I want it to be about them. They deserve it." Teachers these days are going above and beyond to connect with their students. Just earlier this year, a Georgia middle school teacher remixed "Bad and Boujee" to recap the Civil War. As for Cardi B, she&apos;s officially on one: she performed at the Mayweather/McGregor weigh-in on Friday. May good fortune continue to rain down upon all who recognize "Bodak Yellow" for the blessing it is. Watch This Teacher Rap About the Civil War Over Migos' "Bad and Boujee"
Cardi B&apos;s hit Bodak Yellow has transitioned from underground to mainstream catapulting the Bronx rapper to the top of the music charts and airwaves. So it was only a matter of time before others started putting their own spin on it. 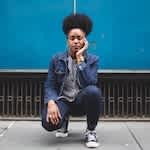 Erica Buddington is a Brooklyn author and arts educator who posted a clip to Twitter Thursday that showed her rapping Bodak Yellow to her 6th grade Capital Prep Harlem class. The result is the most heartwarming clip you&apos;ve seen all week. Erica even got a stamp of approval from Cardi B herself. Hopefully the shoutout gave her the inspiration to continue with her amazing approach to teaching. Erica is the founder of a company called Langston League, which designs "equitable and culturally relevant curriculum, with an emphasis on literacy, for children of color." Erica has also flipped the &apos;Panda&apos; for figurative language and &apos;Mask Off&apos; for their presidents. Last year they also learned "We Will Rock You" to learn about rocks and science.